With its ready-for-anything rendering engine and amazing expandability, Firefox 2.0.0.12 is a superb choice for power users who want to do more than simple surfing. It’s a polished, professional alternative to Safari. Firefox is also full of nice interface touches, from the easy ways to clear private data to the handy scrollbar that lets you zip through multiple tabs. Even better, that interface is extremely customizable. 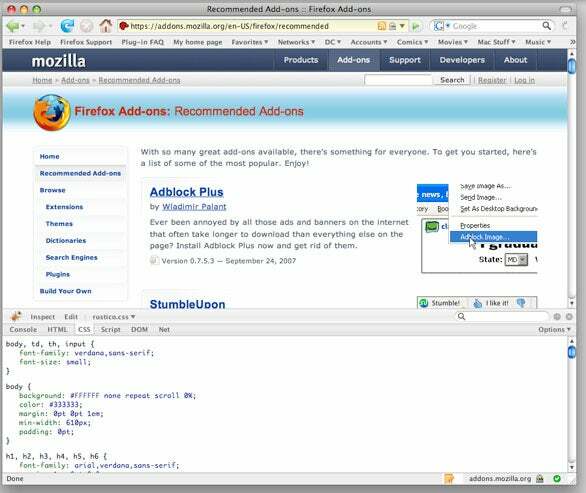 Firefox supports free, user-created add-ons that extend its capabilities. You’ll find hundreds of those add-ons on the Mozilla site, from the popular GreaseMonkey (which lets users add new abilities to existing sites) to add-ons that block malicious scripts, create and edit blog posts, and more. Though Firefox’s default interface is already clean and appealing, you can download themes to personalize its look-and-feel. And while Firefox’s built-in search defaults to Google, you can expand it to include every major search engine, along with such popular sites as Flickr and Wikipedia. Unfortunately, enabling new add-ons requires you to restart the browser. That can be a pain, since Firefox isn’t exactly speedy to load. In my testing, Firefox took anywhere from three to eight seconds to fully load, compared to between one and three seconds for Safari. And it’s no speed demon after it’s launched: Firefox is considerably slower than Safari, taking on average nearly twice as long to load test pages on my iMac G5. Hundreds of free add-ons let you customize Firefox as much as you want. Firefox also struggles with opening multiple tabs. While Safari can smoothly open dozens of new tabs simultaneously, Firefox consistently stalls for several seconds. Its Help menu is also unusually poky—once during my testing, it even crashed the entire program. With version 3 currently in beta testing, promising improved rendering, easier bookmarking, and tighter OS X integration, Firefox can only get better. Serious Web users who don’t mind a little extra heft (and the slower performance that seems to entail) should find this browser’s flexibility both welcome and invaluable.